One of the most versatile stamp sets in Stampin' Up! 's Holiday Catalog is Among the Branches. You can use it for Halloween, Fall, Christmas and winter. I used it to make three Halloween projects for a Splitcoaststampers challenge. I was inspired by a paper sack luminaria and a project I saw at Inspire, Create, Share 2015 to make this mini luminaria. At Stampin' Up! 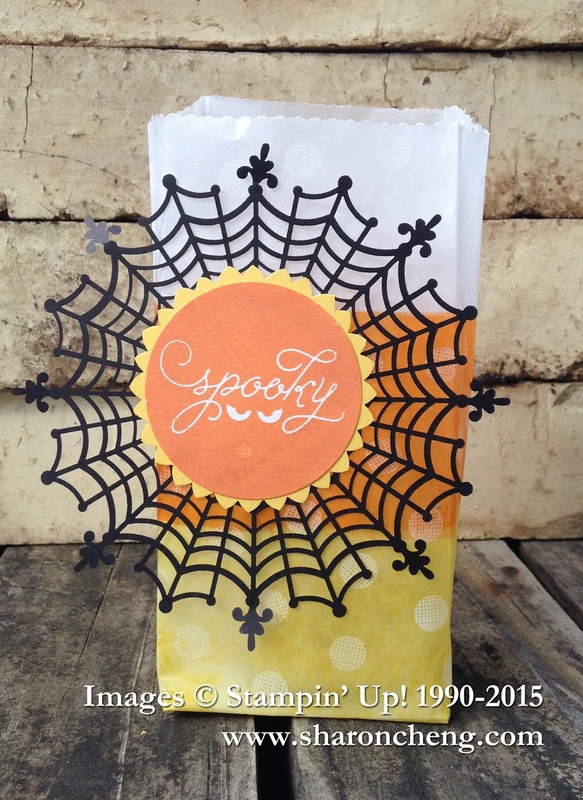 's convention, they showed us how to make the Sketched Dots Gift Bag look like candy corn by using Daffodil Delight and Pumpkin Pie Classic Ink Pads. The colors are added by patting the ink pad directly onto the bag. You will need to mask the bag to keep the stripes straight. After sponging on the color, score 1" along the 3 closed sides of the bag. You then fold them to make a bag that stands up. I did add a 2 3/4" x 2" piece of cardstock at the bottom of the bag to hold the shape. If you like the spider web doily, be sure to order it right away to get it before Halloween. They have already sold out several times. Add a battery-operated candle and you have a fun mini luminaria. 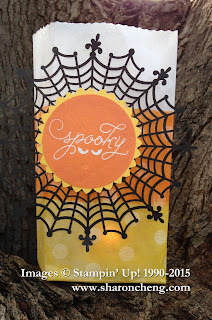 You can use the same spider web doily to decorate this quick and easy Spooky card. I got the idea to stamp the eyes on this bold striped paper from Timeless Elegance after making this card. 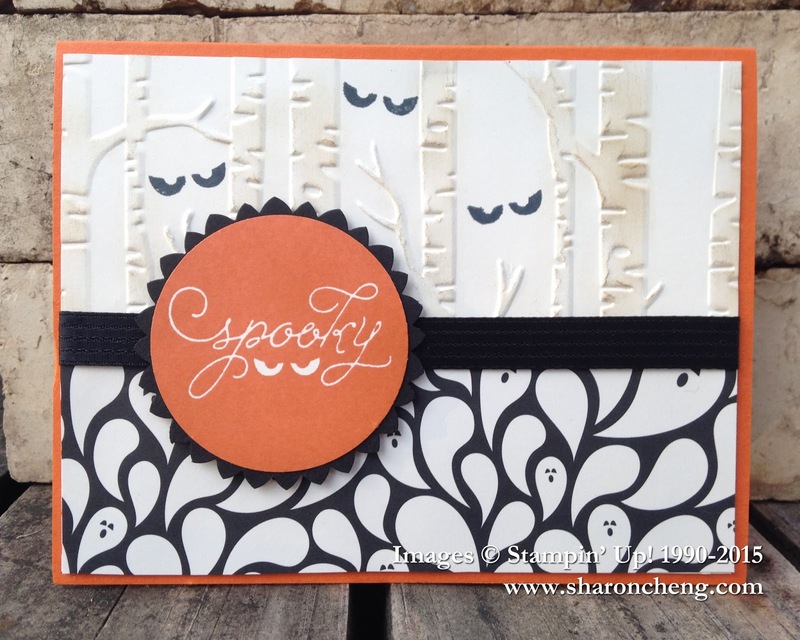 This card also uses the Woodland embossing folder and Happy Haunting Designer Series Paper. After running a piece of Very Vanilla cardstock through the embossing folder, I used a sponge dauber to add a little color to the tree trunks. 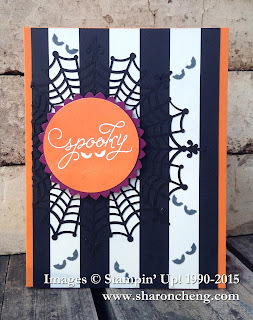 I hope you have fun making your Halloween projects. 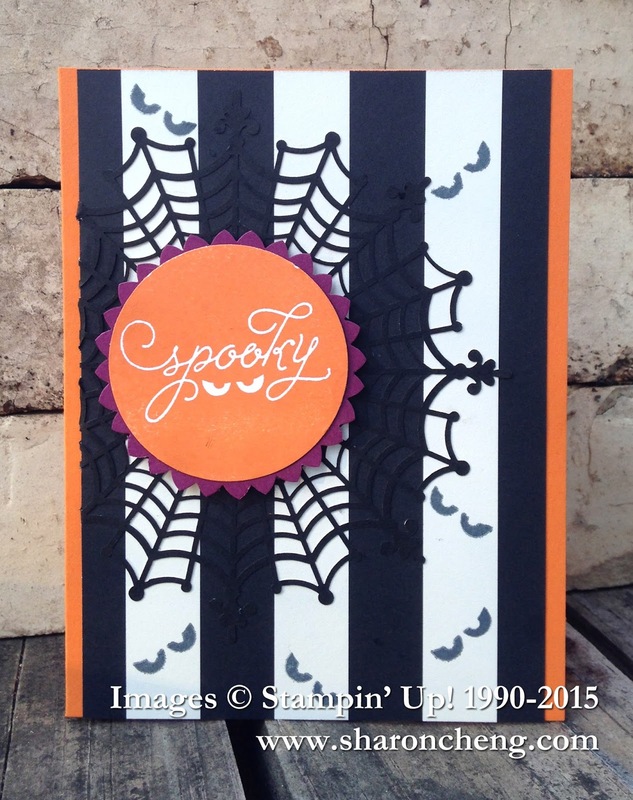 Remember to visit the Splitcoaststampers Gallery for more Halloween inspiration. Here are all of my October Splitcoaststampers Challenges.